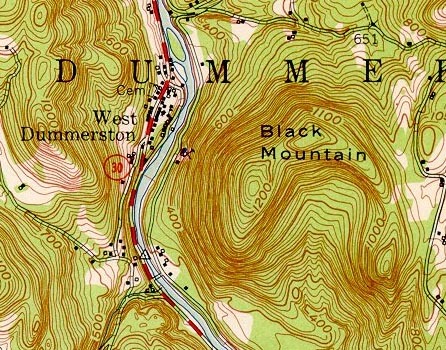 A ski area was apparently proposed for Black Mountain near West Dummerston. While it was mentioned briefly in the press in 1962, it is not known if the area actually ever opened, as the snow season featured a slow start. The small ski area would have featured two rope tows. Maple Valley would open nearby in 1963-64. There are no known remains of the Black Mountain Ski Area.
" The four new family areas which have sprung up around the state to take the overflow of skiers from the larger areas include Carinthia Ski Area at West Dover with a 3,600 T-Bar lift; Black Mountain Ski Area at Dummerston with two rope tows; Glendale at Newfane with two rope tows; and Judgement Ridge at Vershire with an 1800 ft. rope tow. " Birmingham, Dot, and Walt Pesko. "Skiers and Skiing" Hartford Courant. 14 Jan. 1962.